In this up-and-coming zone, find food hall Union Market, trendy restaurants and historic sites like Gallaudet University. Stretching from Union Station to the south and Q and R streets NE to the north, this rapidly developing area takes its name from its location north of Massachusetts Avenue NE. It is best known as a transportation hub and the home of Union Market, a restored grocery and specialty food hall that’s at the epicenter of DC’s gourmet scene. It’s also home to Gallaudet University, the nation’s first college for deaf and hard-of-hearing students, and National Public Radio. Union Market, located in a restored, mid-century food hall, caters to couples, kids and chefs with its mix of restaurants, kitchen supply retailers and gourmet shops selling spices, meat and such. Creative businesses have popped up in the industrial zone surrounding the market, too, including an Angelika movie theater, the Dolcezza Gelato & Coffee Factory and Masseria, a Michelin-starred Italian restaurant from chef Nicholas Stefanelli. For International Women’s Day in 2015, LA-based graffiti artist Mr. Brainwash created a heart-filled mural at Union Market that has quickly become one of the neighborhood’s most Instagramable images. Even first lady Michelle Obama had her photo taken there, when she met the artist. Shops and restaurants have also opened in redeveloped historic buildings like the Hecht’s Warehouse, an early 20th-century department-store storage facility that is now home to a distilleries, acclaimed restaurants and much more. The Uline Arena, a barrel-vaulted brick building that hosted the Beatles first U.S. concert now holds a flagship REI store and Red Bear Brewing Co., the District’s only 100 percent gay-owned brewery. The second-busiest Amtrak hub in the nation, Union Station is situated along Massachusetts Avenue NE. With shopping, restaurants and tours galore, Union Station is a good first stop on your trip to the NoMa neighborhood. 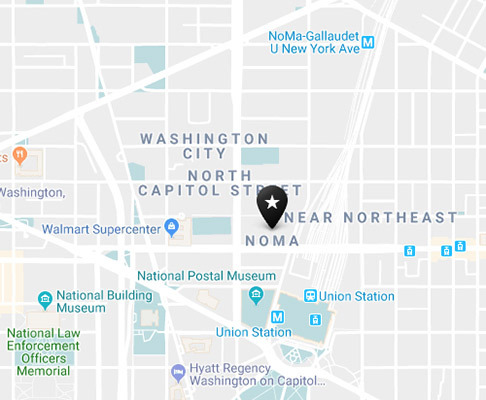 You can also find Capital Bikeshare stations near NoMa, or hop on the eight-mile-long Metropolitan Branch Trail here, which goes all the way to Silver Spring, Md. TaKorean’s Asian-Mexican food and graffiti murals at Union Market, vintage clothing from Nomad Yard Collectiv and Instagramming at Union Station. Metro’s Red Line stops at both Union Station and NoMa-Gallaudet U stations. Capital Bikeshare is a great way to get around on two wheels. DC Circulator bus routes Georgetown–Union Station, National Mall and Union Station–Navy Yard Metro stop at Union Station. From Union Market to edgy restaurants and Union Station, click below to learn more about what it’s like north of Massachusetts Avenue.